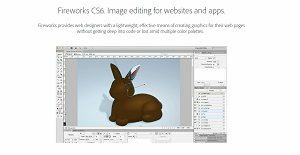 Adobe Fireworks CS6 is designed for users who want a powerful, yet lightweight image editing software that makes it easier to create graphics for websites and apps. Fireworks allows users to get things done with ease and without diving deep into color palettes or coding. The software supports CSS/sprite creation, iQuery Mobile theme skinning and offers API access. Although Fireworks is not meant to replace Photoshop or Illustrator, it does offer powerful tools that make it easier to draw and edit vectors and bitmaps. The image editing software primarily focuses on creating assets for websites and apps. The versatile software for creating, editing and optimizing bitmap and vector images can extract code from CSS designs and allows creating CSS sprites with ease. Adobe Fireworks makes it easier to create and edit bitmap and vector images for websites and apps such as pop-up menus and rollovers. It makes graphic cropping and optimization easier and helps automate repetitive tasks. Users can save images in a variety of formats with reduced size, including JPEG, PNG, PSD and GIF. The image files can also be saved along with HTML files for use on the web. The tools panel includes vector and bitmap drawing/editing tools that allow users to get more done in less time. Software’s powerful optimization tools help achieve the right balance between visual quality and size, which is an important element of web and app graphics. Users can also select the quality-size balance according to their own requirements and content. The graphics can easily be exported to the web after optimization in a variety of formats such as JPEG, animated GIF and HTML tables. Fireworks allows users to do most of their website and app image tasks from a single platform. It supports CSS code extraction from design, allowing users to create CSS sprites. jQuery Mobile theme support and new CSS properties panel minimizes the coding required to create graphics for apps and mobile devices. The software saves a lot of time by allowing users to preview the pages directly from within the program, while they can also preview changes in a browser that is also directly accessible from Fireworks. If you are interested in Adobe Fireworks it might also be a good idea to examine other subcategories of Best Graphic Design Software collected in our database of B2B software reviews. Since each enterprise has unique business needs, it is prudent for them to refrain from seeking a one-size-fits-all ideal software system. Needless to say, it would be pointless to try to find such a platform even among widely used software solutions. The smart thing to do would be to jot down the various vital aspects that need consideration such as required features, budget, skill levels of workers, company size etc. Then, you should do your research thoroughly. Read some Adobe Fireworks reviews and investigate each of the other apps in your shortlist in detail. Such in-depth homework can ensure you discard ill-fitting systems and select the solution that offers all the elements you require for business success. How Much Does Adobe Fireworks Cost? Included in the Adobe Creative Suite, but Adobe has ended support and updates of Fireworks, and doesn’t offer it as a standalone product. For more enterprise pricing details on Creativity Cloud, please contact support. We realize that when you make a decision to buy Graphic Design Software it’s important not only to see how experts evaluate it in their reviews, but also to find out if the real people and companies that buy it are actually satisfied with the product. That’s why we’ve created our behavior-based Customer Satisfaction Algorithm™ that gathers customer reviews, comments and Adobe Fireworks reviews across a wide range of social media sites. The data is then presented in an easy to digest form showing how many people had positive and negative experience with Adobe Fireworks. With that information at hand you should be equipped to make an informed buying decision that you won’t regret. What are Adobe Fireworks pricing details? What integrations are available for Adobe Fireworks? Adobe Fireworks is an open API tool, which means that developers can build their custom connections with third-party software. If you need more information about Adobe Fireworks or you simply have a question let us know what you need and we’ll forward your request directly to the vendor.